Within minutes of arriving in Bangkok, our friends, Bob and Alison, greeted us at the airport with a van in waiting, and whisked us away to our hotel. Even before we had a chance to culture-shock, we found ourselves in Bangkok's Monday morning rush hour, and an hour-plus traffic jam. During this "downtime," as it were, we were offered a menu of plans for our morning: drop the bags at the hotel, get a hands-on education of the subway and sky train, take a trip to the mall, and brunch at an "American" restaurant. If we survived that far, Toledo's dungeons would seem a resort to what might follow. So we happily agreed as we were strapped to our fate, and I thought to myself, "Perhaps this is merely Bangkok culture. They're simply immune to the the effects of a 14-hour time difference and a 17-hour flight, and I'm just a sissy for feeling tired." I felt stronger, and onward we went. My wife and I married almost 20 years ago, at a time when she spoke Spanish and almost no English, and I spoke English and almost no Spanish. They say love is blind, and I believe that it is probably deaf, as well (at least it probably should be). But I digress from my point, which is this: I am used to misunderstandings in language. I am conditioned. It is my career. It is my life. My experience has taught me how to use different or simpler words when trying to communicate to people who speak English as a second language. And before arriving in Bangkok, I prided myself that I was somewhat good at it. But no more. I am humbled. My wits have been divided and conquered. And the victors always smile. At the hotel we picked up John, an Evangelist from America who was preaching at Bob's church for the week. And upon arriving at the restaurant, we met up with Christien and Shannon, more friends from America living in Bangkok. John ordered a cappuccino, and asked the waitress to make it a "double." She agreed, and scribbled down his order. I liked the sound of that, so I too asked for a double-shot cappuccino. But the waitress looked confused. I explained, "A double-shot, just like him." She still seemed confused, but said she understood, scribbled some notes and walked away. Moments later, she brings two cappuccinos out, and they looked delicious. They were served in the short European-style coffee cup, perfectly frothy, and the froth was prepared with an artistic leaf design. Shortly after, she returned with another cappuccino, but it was served in the larger American-style coffee cup. We explained that no one else had ordered coffee, and she explained that I had ordered a large coffee, a "double" coffee. We had thought that the first two cups were for John and I, but in fact they were just for John--they were his "double" cappuccino. My "double" came in the form of a large double-sized, and she was certain she got it right. Thus the omens of miscommunication began to be fulfilled in Bangkok, and have continued every day since. Food defines culture. And learning to properly eat foreign food is viewed by some as a social badge of honor. Consider the world-popular ramen noodles. Most Americans would eat a bowl of ramen noodles with a fork, like a plate of spaghetti. But Thai people typically eat ramen with a pair of chopsticks and a Chinese spoon. They lift the noodles with the chopsticks, neatly place them into the spoon, and gracefully eat them with table manners worthy of royalty. Now that I know how to properly eat ramen in Thailand, I can proudly display my new badge. Like many people that I know, I’ve often viewed different foreign foods as one of life’s small adventures. I have tried and enjoyed many times such culturally diverse foods that make most Americans cringe with disgust. I have had Mexican menudo and pozole, tacos de lengua (cow tongue), and even tacos de sesos (cow brain). I’ve tried French delicacies of escargo (snails) and many times enjoyed fois gras pate (fatty liver). I’ve been treated to Philippino dishes that included goat tripe, and others with the ominously anonymous title of “lo mein with ‘meat’”--just “meat”...and the feeling that you shouldn’t ask for more details. I have had Native American dishes such as fry bread and mutton stew (including assisting in the slaughter of the sheep). I have eaten shark, javelina, rabbit, and at a much younger age than I remember, squirrel. I hope it is obvious that I do not easily “culture shock” over foreign food items. Snake skin. It actually looked like a bag full of many skins from some sort of eel...they still had some of the fins. Giant octopus. I've had smaller octopus and squid many times, even recently. But I just can't imagine this creature as the main course. Giant water bug (female). This was what pushed me over the edge. They looked like nothing but sewer roaches, vacuum sealed and frozen in packs of ten. I thought I had seen these things in a pest control ad. I just can't seem to imagine any method of cooking that would make these any more enticing, less yet consumable. Pardon me...just writing this is making me culture shock. It was once my pride to "try anything once," and "see how the other half lives." But what was once my pride now lies conquered in the frozen food section at the store called Makro. I close my eyes, and long for bonafide American food. Fortunately, they also sell plastic-wrapped imported cookies. Click here for large version of picture below. It looks like you are having quite some experiences. I wouldn't want to eat the bugs either.You know I also ate many odd things overseas and locally as well. Squirrel, possum and racoon were staples back home in WV.Octopus is not so flavorful that I would deliberately order it. Calamari is tasteless too. 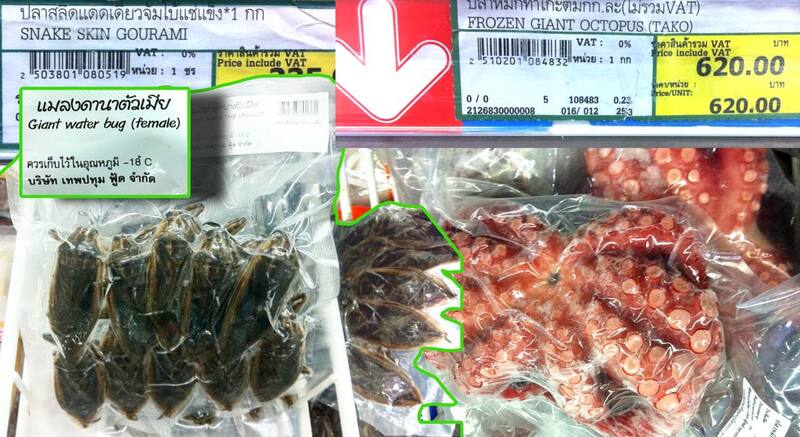 I imagine you will be well schooled in seafood after some time in Thailand. I will keep checking your blog in lieu of emails from time to time. Look for me to post here once in awhile too. Have a good experience there. I wasn't there long enough myself to learn much of the culture so you can enlighten me on it with every one else. I keep forgetting the large time difference but I will get it down so I can Skype you . "Toledo's dungeons" refers to the Spanish Inquisition, mentioned in Poe's "The Pit And The Pendulum." A friend of mine once explained to me the theory of "folded space." The details are only fully explained in the "worm holes" of science fiction, but the concept is simple enough: folded space allows you to instantly jump from one place to another. Another law of physics states that for every action there is an equal and opposite reaction. By applying the law of physical science to the theory of folded space, I believe that if you can quantum leap in time and space, then there must be another place equal and opposite: a place where you are stuck in the quantum leap for an indeterminate amount of time, and moving the smallest of distances can take an eternity. I call it Unfolded Space, and I know it exists every time I attempt to travel through Bangkok traffic.